The MetaTrader 5 platform was originally designed for trading within the netting position accounting system. The netting system allows having only one position per financial instrument meaning that all further operations at that instrument lead only to closing, reversal or changing the volume of the already existing position. In order to expand possibilities of retail Forex traders, we have added the second accounting system — hedging. Now, it is possible to have multiple positions per symbol, including oppositely directed ones. This paves the way to implementing trading strategies based on the so-called "locking" — if the price moves against a trader, they can open a position in the opposite direction. Since the new system is similar to the one used in MetaTrader 4, it will be familiar to traders. At the same time, traders will be able to enjoy all the advantages of the fifth platform version — filling orders using multiple deals (including partial fills), multicurrency and multithreaded tester with support for MQL5 Cloud Network, and much more. Now, you can use one account to trade the markets that adhere to the netting system and allow having only one position per instrument, and use another account in the same platform to trade Forex and apply hedging. This article describes the netting and hedging systems in details, as well as sheds light on the changes related to the implementation of the second accounting system. To open a real account with hedging, contact your broker. 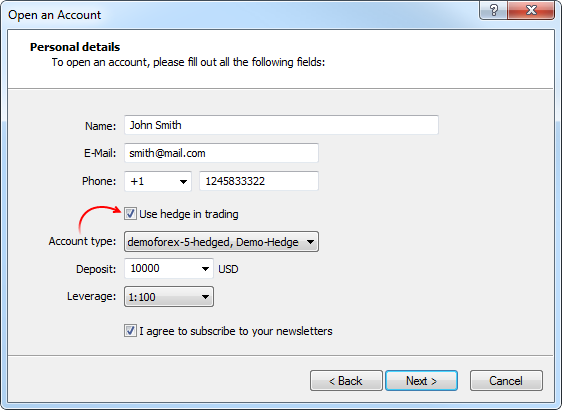 The new trade operation type has been added for hedging accounts — closing a position by an opposite one. This operation allows closing two oppositely directed positions at a single symbol. If the opposite positions have different numbers of lots, only one order of the two remains open. Its volume will be equal to the difference of lots of the closed positions, while the position direction and open price will match (by volume) the greater of the closed positions. In case of a single closing, traders have to pay a spread twice: when closing a buy position at a lower price (Bid) and closing a sell position at a higher one (Ask). When using an opposite position, an open price of the second position is used to close the first one, while an open price of the first position is used to close the second one. In the latter case, a "close by" order is placed. Tickets of closed positions are specified in its comment. A pair of opposite positions is closed by two "out by" deals. Total profit/loss resulting from closing the both positions is specified only in one deal. For pending orders (if the margin ratio is non-zero), margin is calculated separately. The weighted average value of the ratio and rate is used when taking into account the margin ratio and converting margin currency to deposit currency. Now, each position has its unique ticket. It usually corresponds to the ticket of an order used to open the position. A ticket is assigned automatically to all available positions after the terminal update. 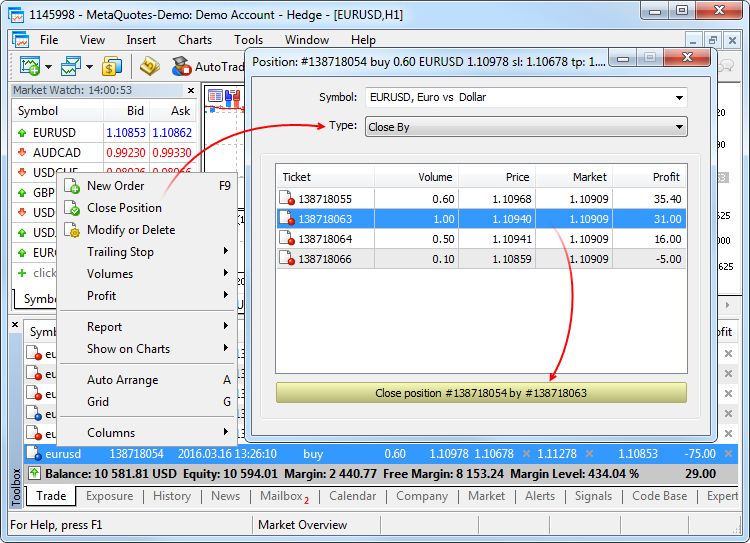 When modifying or closing a position in the hedging system, make sure to specify its ticket (MqlTradeRequest::ticket). You can specify a ticket in the netting system as well, however positions are identified by a symbol name. position — position ticket. Fill it when changing and closing a position for its clear identification. It usually matches the ticket of an order used to open the position. position_by — opposite position ticket. It is used when closing a position by an opposite one (opened at the same symbol but in the opposite direction). position — ticket of a position affected by transaction. It is filled for transactions related to handling market orders (TRADE_TRANSACTION_ORDER_* except TRADE_TRANSACTION_ORDER_ADD, where a position ticket is not assigned yet) and order history (TRADE_TRANSACTION_HISTORY_*). position_by — opposite position ticket. It is used when closing a position by an opposite one (opened at the same symbol but in the opposite direction). It is filled only for orders closing a position by an opposite one (close by) and deals closing by an opposite one (out by). The new PositionGetTicket function returns a position ticket by an index in the list of open positions and automatically selects that position for further work using the PositionGetDouble, PositionGetInteger, and PositionGetString functions. The new PositionSelectByTicket function selects an open position for further work by a specified ticket. PositionSelect selects a position by a symbol name for further work using the PositionGetDouble, PositionGetInteger, and PositionGetString functions. In the hedging system (where there can be multiple positions at a single symbol), the function selects a position with the lowest ticket. Used for the over-the-counter market when accounting positions in the netting mode (one position per symbol). Margin calculation is based on a symbol type (SYMBOL_TRADE_CALC_MODE). Used on the exchange markets. Margin calculation is based on the discounts specified in symbol settings. Discounts are set by the broker, however they cannot be lower than the exchange set values. Used for the over-the-counter market with independent position accounting (hedging, there can be multiple positions at a single symbol). Margin calculation is based on a symbol type (SYMBOL_TRADE_CALC_MODE). The presence of multiple positions at a single symbol is considered. The new property SYMBOL_MARGIN_HEDGED allows receiving the value of a hedged margin by a trading symbol. Margin calculation in the hedging system of position accounting has been described above. TRADE_ACTION_CLOSE_BY — new trading operation type — close a position by an opposite one. ORDER_TYPE_CLOSE_BY — new order type — close a position by an opposite one. ORDER_POSITION_BY_ID — new order propertiy — ticket of an opposite position used for closing the current one. DEAL_ENTRY_OUT_BY — new deal type — close a position by an opposite one. 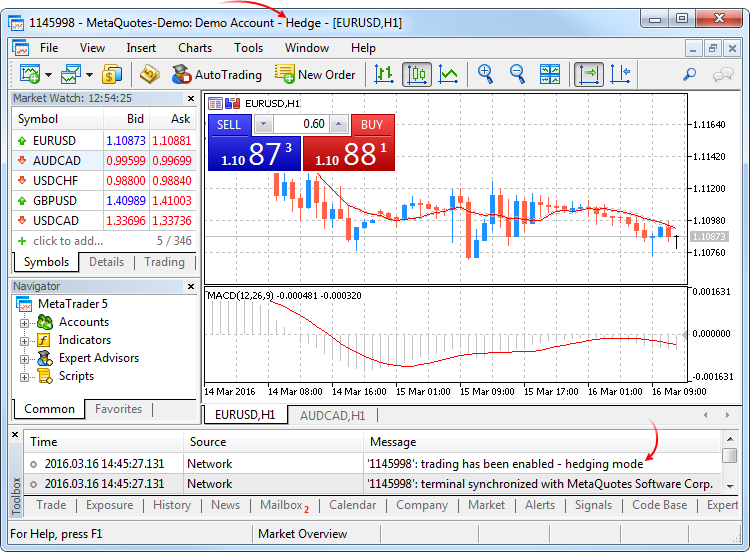 Now, you can use MetaTrader 5 to trade both stock markets and the popular retail Forex with hedging. Developers of the automated systems applying hedging have received another important advantage. Apart from the multithreaded tester, the entire computing capacity of the MQL5 Cloud Network is at their disposal now. Update your platform and try the new features! Most MT4 traders are highly tied to the "hedging system", that's the only reason. (Just my own opinion). I see one great advantage when trading different time frames. On the netting system it was necessary to keep virtual positions on each time frame, virtual stop loss and take profit orders, etc. That was a lot of work. I could be long on EURUSD on H1, short on H8 and long on D1 all with different stop loss levels and there was no easy way to handle that with the netting system. With the possibility of closing different positions on the same currency that problem is solved and trading on the way I described on the same currency is a lot easier. Of course, that's a lot easier. There's something I must not be grasping here. I don't see any overall benefit when it comes to hedging this way. I mean, as I see it, the reason MQL5 never allowed hedging like this in the first place was because hedging a position by opening an opposite position is the same thing as simply closing the first one. Why would a user prefer the "hedging system" to the "netting system"? The only reason I could see for this implementation is more compatibility with brokers, somehow. Any insights here? In other words, while the MT5 is advertised to have more features than MT4, it (in fact) restricts the traders' options. This article continues the series of publications on a universal Expert Advisor model. This part describes in detail the original event model based on centralized data processing, and considers the structure of the CStrategy base class of the engine. The "area method" trading system works based on unusual interpretation of the RSI oscillator readings. The indicator that visualizes the area method, and the Expert Advisor that trades using this system are detailed here. The article is also supplemented with detailed findings of testing the Expert Advisor for various symbols, time frames and values of the area. The previous articles contain the implementation of the classes for creating constituent parts of the main menu. Now, it is time to take a close look at the event handlers in the principle base classes and in the classes of the created controls. We will also pay special attention to managing the state of the chart depending on the location of the mouse cursor.